VANDENBERG AIR FORCE BASE — A video camera mounted aboard the United Launch Alliance Delta 2 rocket beamed back remarkable views of NASA’s SMAP spacecraft being deployed into orbit and opening its solar panels Saturday. “I guess most people saw that wonderful spacecraft separation video that we had that was transmitted back to us from our African ground station. It was spectacular!” said Tim Dunn, the NASA launch director. “You saw a clean separation from the Delta 2 second stage. And about 30 seconds later or so you saw the solar arrays start to deploy,” Dunn said. The video was relayed via the Hartebeesthoek tracking station in South Africa to launch control at Vandenberg Air Force Base in California. Rocket-mounted cameras are becoming commonplace aboard launches these days. They offer inspiring views of key milestones during a rocket’s ascent, plus give engineers a look at the hardware as it performs. Some 57 minutes after the Delta 2 blasted off at 6:22 a.m. local time, the second stage gently let go of the SMAP spacecraft into its preliminary 411 by 425 mile orbit. The power-generating solar arrays were folded up against the observatory’s body for launch before springing free moments after the rocket’s release. 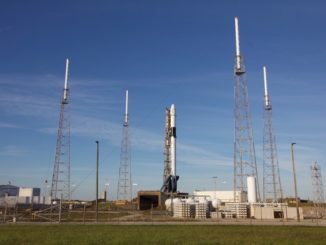 The liftoff attempt Saturday went down to the wire due to upper level winds the rocket would face during flight, which were “no go” during much of the countdown. A final set of weather balloons reported green results to wind analysts in Denver while the countdown was paused at T-minus 4 minutes, allowing the team to pick up the clock and launch. The high-altitude winds posed the only issue during the three-hour countdown sequence. This was the 153rd Delta 2 launch since the rocket’s debut in 1989 and the booster’s 98th straight success dating back to 1997. 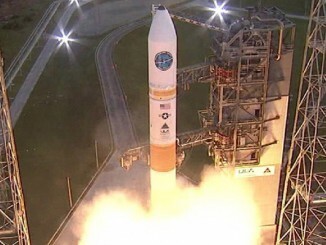 It was the second flight this year for United Launch Alliance and the company’s 93rd overall. NASA has bought two of the three remaining Delta 2 rockets in inventory for launches of the JPSS 1 civilian weather satellite in November 2016 and the ICESat 2 spacecraft six-eight months later in 2017. The SMAP spacecraft now beings a choreographed process over the next 60 days to unfurl its 20-foot antenna reflector and spin it up to 14.6 rpm for the start of science. “Scientists and policymakers will use SMAP data to track water movement around our planet and make more informed decisions in critical areas like agriculture and water resources,” said NASA Administrator Charles Bolden. See our earlier SMAP coverage. And see our Delta archive for further information.